The Antarctic continent is for the most part surrounded by passive margins, except for a restricted segment along the northern termination of the Antarctic Peninsula. Extensive single-channel and multi-channel seismic reflection surveys carried out in the last two decades, have clarified many aspects of the structure and stratigraphic setting of these margins, and highlighted the importance of the seismic facies analyses for the reconstructions of ice sheet history (i.e., the ANTOSTRAT program, Cooper et al., 1995). Due to the hostile local environment, the knowledge of the Antarctic margins is still uncomplete, allowing for regions adequately covered by seismic surveys to be adjacent to unexplored areas. 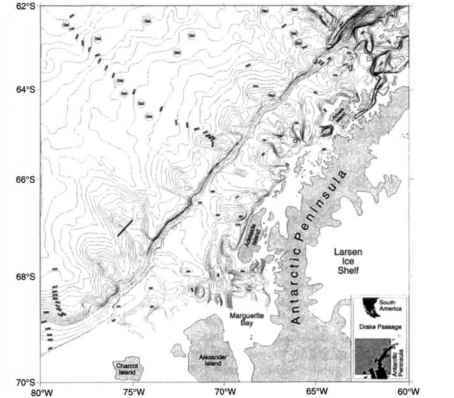 The recognition of BSRs on seismic profiles from the Antarctic margin (Fig. 1) has been mostly incidental and only one specific survey has been devoted to the study of BSRs (South Shetland margin, Lodolo et al., 1998). BSRs have been reported in four areas: on the Wilkes Land margin (Kvenvolden et al., 1987; Tanahashi et al., 1994), on the South Shetland margin (Lodolo et al., 1993), on the Pacific Margin of the Antarctic Peninsula (Rebesco et al., 1996), and on the South Orkney continental block (Lonsdale, 1990). Only in two cases, the BSRs represent the base of the HSZ (South Shetland and Wilkes Land margins); the others BSRs appear most likely caused by silica diagenesis or by still unclear compaction effects. and this probably has contributed to attract the interest of some commercial oil companies (the French Institute Française du Petrole, the Brazilian Petrobras, the Japanese National Oil Corporation, among others) in the extensive exploration of the continental shelves around Antarctica during the early 80's. Nowadays, there is a general consensus among Antarctic researchers that petroleum likely occurs in some of the sedimentary basins both onshore and offshore, but politics has always inhibited active exploration and in particular exploitation, as recently reaffirmed at the Madrid's «Conference for the Preservation of the Antarctic Environment» in 1995. Fig. 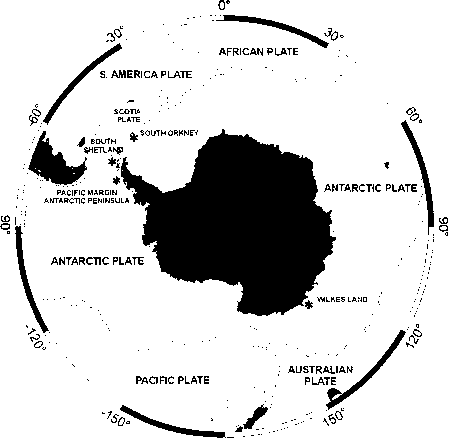 1 - Map of the occurrence of BSR's around the Antarctic continent (asterisks indicate the areas where BSR's have been documented from seismic profiles). 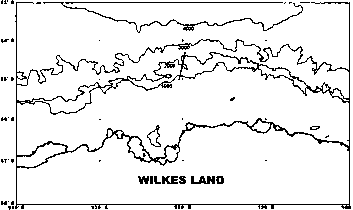 The Wilkes Land margin is a passive continental margin (Fig. 2) created by the mid-Cretaceous rift (Eittreim & Smith, 1987; Eittreim, 1994), which definitively separated Australia from Antarctica. Sea-floor magnetic anomalies indicate a sequence of slow, medium, and then fast spreading rates between the two continents (Cande & Mutter, 1982; Veevers, 1987). Traces of rifting events have been preserved in the sedimentary architecture of the margin and in the main unconformities bounding the stratigraphic sequences within the Cenozoic post-rift sequences (Wannesson et al., 1985; Eittreim & Smith, 1987; Tanahashi et al., 1987; Tanahashi et al., 1994). Cenozoic margin progradation, generating slopes up to 10° (Eittreim et al., 1995) is widely observed in the younger sequences overlying aggradational sequences beneath the outer continental shelf, both reflecting advances of the east Antarctic ice sheet to the shelf edge (Cooper et al., 1991). Continental rise deposition is by development of deep-sea fans (trough-mouth fans) and sediment drifts. Finely stratified diatomaceous ooze and mud, reaching about 40 m in thickness on the inner shelf represent Holocene postglacial open marine deposition (Domack et al., 1991) and overlie diamicts of glacial origin. The inner shelf is incised by channels (up to 1000 m relief) carved by the ice (Domack et al., 1989). The outer shelf is characterized by isolated banks (about 200 m below sea level), probably morainal deposits, suggesting former positions of the grounding ice sheet. Fig. 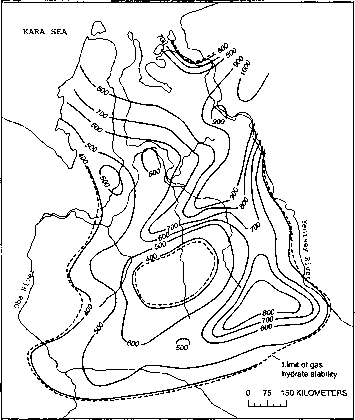 2 - Simplified bathymetry (contours every 1000 m) of the Wilkes Land margin. The thick segment indicates the profile presented in Fig. 6. Fig. 3 - Detailed bathymetry of the Pacific margin of the Antarctic Peninsula, obtained combining underway and satellite-derived data (Rebesco et al., 1998). The thick segment indicates the part of profile in Fig. 8.